How would you react if you discovered that your great-great grandmother was rumored to be a ghost? Boulder Jewish journalist and author Hannah Nordhaus learned of precisely such a rumor and responded the way any self-respecting writer would: She wrote a book about it. The resulting volume, American Ghost: A Family’s Haunted Past in the Desert Southwest, released in March by HarperCollins, tells the compelling tale of Julia Staab, a German Jewish immigrant to Santa Fe in the mid-19th century, one of the first Jews to reside in the old city, and the author’s great-great grandmother. What makes American Ghost more than a historical account are stories that Julia’s wraith has long haunted her own home, a lavish Second Empire mansion built by her successful husband, Abraham Staab, which now boasts, in a restored state, the title La Posada (place of rest) and serves as a prestigious hotel in Santa Fe’s now-chic Old Town. Nordhaus exhaustively researched genealogical records, newspaper archives and family papers to bring this untold story to life. The book is part family history, part ghost story, part paranormal investigation and part urban history. 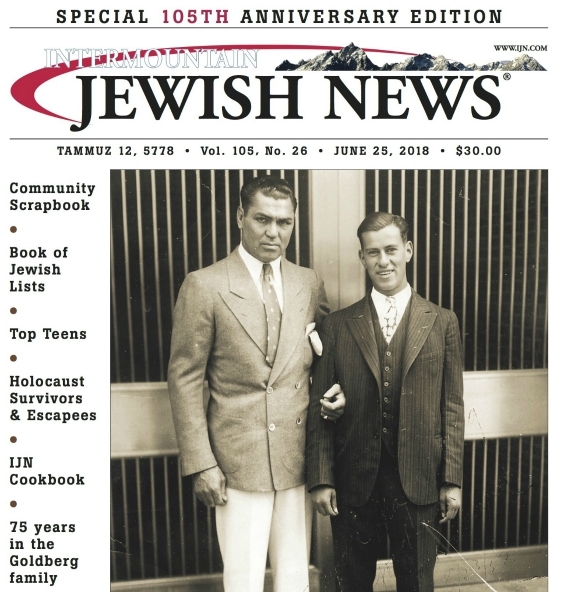 The author discovered that it was also a very Jewish tale, illuminating not only the unique challenges faced by Jewish immigrants to the American West but the benefits that their Jewish backgrounds often brought them. As Nordhaus delved into dusty documentary materials, she also gained fascinating knowledge about mid-19th century Jewish culture in Germany, and about the fates of those who chose to stay in the Old Country instead of making the bold move to America, as Julia did. More than any of this, American Ghost serves as an incomplete but compelling biography of a pioneer wife and mother who never quite felt comfortable in her adopted home in the Southwest, who may have suffered from deep depression for much of her life and who, indeed, may have ended her own life by suicide — all possible reasons why Julia Staab’s primary legacy today is a ghostly one. With American Ghost, Nordhaus — a speaker at the Loup JCC’s Book Fest last October — adds another chapter to an eclectic writing career that has featured non-fiction articles in national and local newspapers and magazines. Her subjects have ranged from wildlife crime investigators in Oregon to salmon counters in Idaho to dog poop “mappers” in Boulder — as well as her 2011 bestselling book, The Beekeeper’s Lament, which deals with the alarming decrease in the honeybee population. Nordhaus, who grew up in Washington, DC, spoke to the Intermountain Jewish News in November in the sunny and comfortable Boulder home she shares with her family. IJN: Who is buying American Ghost? Is there any pattern to that? Nordhaus: “A bit of my struggle in reaching people is that the book has a lot of different aspects and a lot of different potential audiences. When I wrote the book I thought that was a good thing, but in bookselling they’re used to marketing in niches. I think it’s probably sold best to people who have an interest in Western history and New Mexico, particularly. “There is obviously some Jewish interest. I don’t think we’ve exploited that very well. It’s not really marketed as a Jewish book. “I don’t think my intended audience is really ghost people, people who are interested in paranormal stories. They tend to hate it. People think it’s going to be a typical ghost book and really it’s a history book. “I have tried to change the title and they would not let me. When we do the paperback we’ll change the subtitle and jacket copy to put more emphasis on history and less on paranormal. When you started on the research that led to this book, did you have any idea how Jewish Julia’s story was going to be? “No, I didn’t at all. When I started I really didn’t think it was a Jewish book. It was about a Jewish family but it was a family in the West and it’s an Old Western story about New Mexico and about this house and this sad woman who is said to haunt the house. “I sort of knew the details of Julia’s life — that she came from Germany, that she lived in the house, that she had a bunch of children, that she’d lost a child, that she’s reputed to be a ghost. The first thing I researched was where they came from, a village called Luchte, — and then I researched what it was like for Jews in 19th-century Germany. “Suddenly, it became very much a Jewish book. What I knew about Jews in Germany was basically the Holocaust but I didn’t know what life was like before, trying to figure out the pull of America, what pushed them from Germany. I learned a lot about how difficult it was to be Jewish, even then, well before the Nazis were on the scene. And a very Western American Jewish story as well, which is also a piece of Jewish history that’s not widely known outside of this region. “You think of Jewish history in the US and Jewish immigrants and you think of Orchard Street on the Lower East Side with everybody crammed together. That was my maternal grandmother’s story. They were very much typical Eastern European immigrants to New York. Do you think that the West was open to Jews? Julia to assimilate with the Hispanic and Native American cultures. “Jews assimilated with the white culture. My theory — and some people may take offense — is that because they were whites they were accepted. There weren’t the distinctions like there were in New York with Eastern European Jews, German Jews. Did all of that research and discovery affect the way you view Judaism or Jewishness? “Yes, for sure. It connected me with my heritage in a way that I hadn’t been. “My Jewish connection was on my mom’s side which is a much more traditional Jewish story. We were not religious growing up. I never set foot in a temple. We did Chanukah, we did Passover and culturally I absorbed my family’s history. “My family’s history in New Mexico was much more about being pioneers and builders of that society. The Jewishness was sort of an aside. My dad didn’t even know he was half-Jewish until he was 14 years old. There was not on that side an embrace of our Jewish heritage. “Learning what I learned certainly made me realize how Jewish they were; how important it was to their identity. I also learned that the Old West wasn’t just isolated unto itself. These stories of the West are stories of immigration and assimilation and race and gender and all the things you sort of isolate from Old Western stories. “Clearly, with this book, I’ve sort of outed myself as a Jew. I think a lot of people probably didn’t know that I was Jewish. I feel more Jewish than I did before. A striking aspect of the book is the sadness of the story from Julia’s point of view. You conjectured that she was depressed for much of her life. “That’s fair to say. I wanted to try to get to know her as much as I could when I started this process. Finding her daughter Bertha’s diary was really a big step in that direction. Even though Julia wasn’t mentioned much, I got a sense of how difficult it was for her and for her family trying to care for her. “I felt so sad for her. I felt that she didn’t have a lot of choices in her life. She did not have the opportunities that I have as a 21st-century woman. She didn’t have modern psychiatric medicine available to her. At that point their solution to female depression was hysterectomies and rest cures. It was quite barbaric. “Obviously life was harder for everybody but I think that even though she had lots of material wealth, there was a deep sadness in her core. I really feel for her. If you could, through some scientific or supernatural means, interview Julia, what would you like to ask her? “Gosh, I have tried, through psychics. “What would I ask her? The things I asked the psychics: How did she die? Did she love Abraham? Was she ever happy? Did she miss Germany? Did she ever come to embrace her life in New Mexico? How did she feel about being a mother? Do you think there could be a common language between a post-feminist woman of 2015 and a pioneer immigrant woman from, say, 1890? “When I went ghost hunting at the Stanley Hotel, the guy talked to me about time splits, where you sort of peer into each other’s eras. It’s when you see somebody from another era and they see you. “I’ve very much had that image. I’ve been trying really hard to peer into her life, but what would she think if she peered into mine? Since the publication of the book have you been back to Santa Fe? Does this buttress the possibility that maybe something supernatural is going on at La Posada? “Since the book has come out I’ve heard so many stories. They all seem like reasonable people, not like they’re crazy. Most people say they’ve never believed in ghosts, they’ve never had an experience like this, and then they tell me their stories. Do you think Santa Fe itself has a special mystical quality to it? “It’s just such a special place. It’s everything from the quality of the light to the age of all the buildings and all of the different cultures piled on top of each other. “If ghosts do walk the earth, they probably do in Santa Fe. Has the experience of writing American Ghost changed the way you believe in or regard the supernatural and such issues as the soul? “I don’t think it has changed as much as crystallized. I have no idea what’s going to happen after I die, or where my loved ones are. I’m a historian, a journalist, a facts person. “If you talk to me 10 or 20 years down the line, when I’ve probably had more death and grief under my belt, I may feel differently, but I don’t think I could ever say with complete conviction that I know what happens after you die. And I really don’t trust anybody who does, because how do they know? So what you described as happening to you at La Posada, and which you included in the book, is not enough to convince you? “I don’t think there could be enough to convince me. I’m not saying there’s no such thing as an afterlife, but I’m also not saying that there is, which is sort of a namby-pamby answer. “But even if Julia’s ghost materialized and sat down where you’re sitting and answered all of the questions that I said earlier I want to ask her, I don’t know if I’d trust myself to believe it. “If you are inclined to believe in ghosts, you’ll believe my story. If you’re not inclined, you’re never going to believe what I have to say. It’s so subjective and I’m comfortable with that level of subjectivity. I don’t see how you could ever say that you know. Nobody knows. “One of the things that was difficult about writing this book was the level of uncertainty, the unanswered questions, the mysteries that remain.